Classical multivariate statistical inference methods (Hotelling’s T 2, multivariate analysis of variance, multivariate regression, tests for independence, canonical correlation analysis, principal component analysis, etc.) are based on the use of the regular sample mean vector and covariance matrix. See, for example, the monographs by Anderson (2003) and Mardia et al. (1979). These standard moment-based multivariate techniques are optimal under the assumption of multivariate normality but unfortunately poor in their efficiency for heavy-tailed distributions and are highly sensitive to outlying observations. The book by Puri and Sen (1971) gives a complete presentation of multivariate analysis methods based on marginal signs and ranks. Pesarin (2001) considers permutation tests for multidimensional hypotheses. In this book nonparametric and robust competitors to standard multivariate inference methods based on (multivariate) spatial signs and ranks are introduced and discussed in detail. 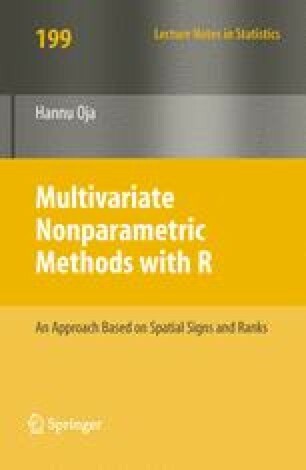 An R statistical software packageMNM (Multivariate Nonparametric Methods) to implement the procedures is freely available to users of spatial sign and rank methods.